have not the staying power of a lily in a cottage garden. It's been far too long since I've had a cottage garden. I miss the reunion with my perennial friends each spring. The tending and pruning and coaxing of each one into glorious blooms. I long to get garden dirt under my fingernails again. 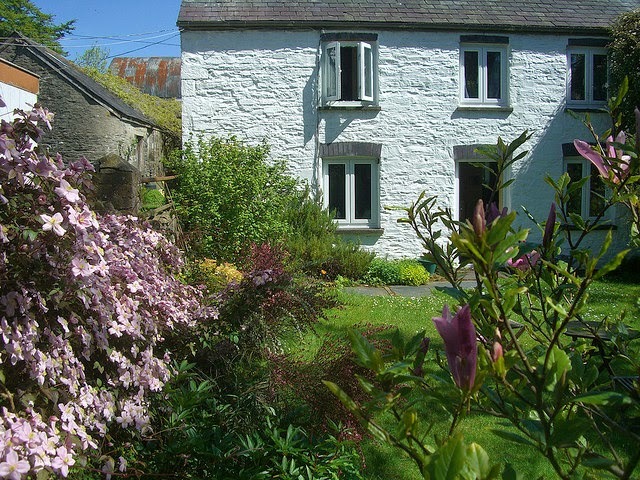 Hopefully, next year we'll be in our new cottage and I'll have a real garden. 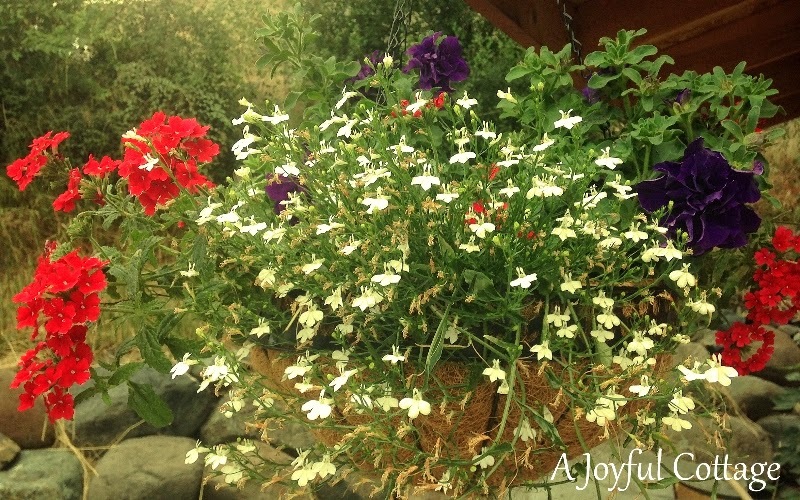 For now I must be content with red verbena, purple petunias and white lobelia in a hanging planter outside our apartment. This month we've been partying outdoors at Every Room In The House. 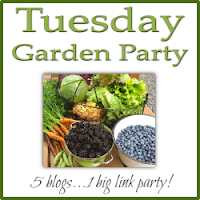 Before the party ends, I thought it would be fun to join in with a Cottage Garden Tour. So, put on your walking shoes and let's go. 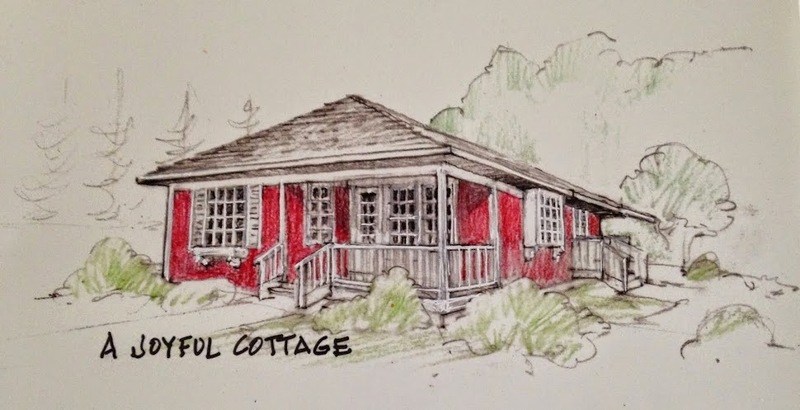 This first cottage in British Columbia seems to be growing up out of the garden. You'll notice I'm including the cottages in our tour. 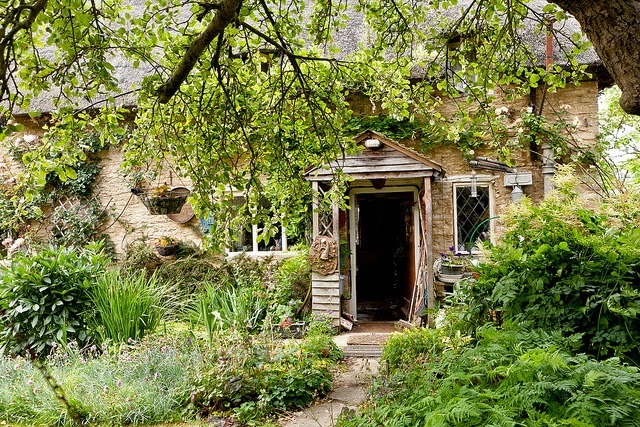 Can we ever get enough of real cottages and the gardens that go with them? 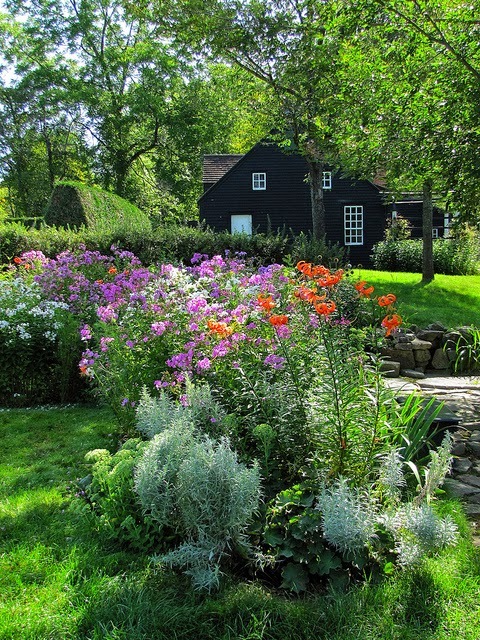 The colors in this garden echo the cottage brick. 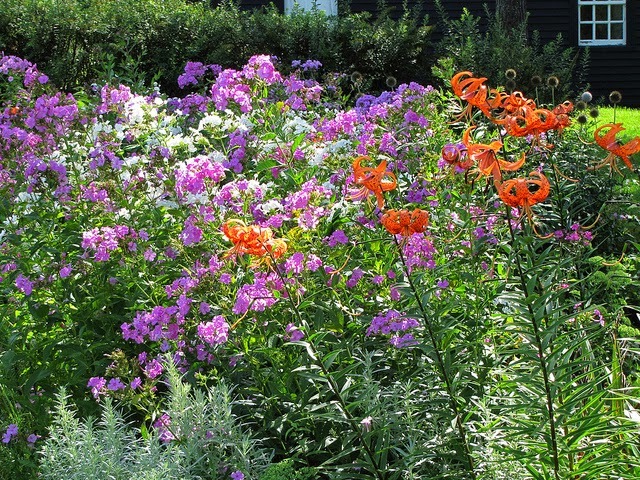 Purple and orange steal the show in this South Berwick, Maine garden. Overgrown is perfectly acceptable in a cottage garden. Stone walls and rugged wooden gates too. 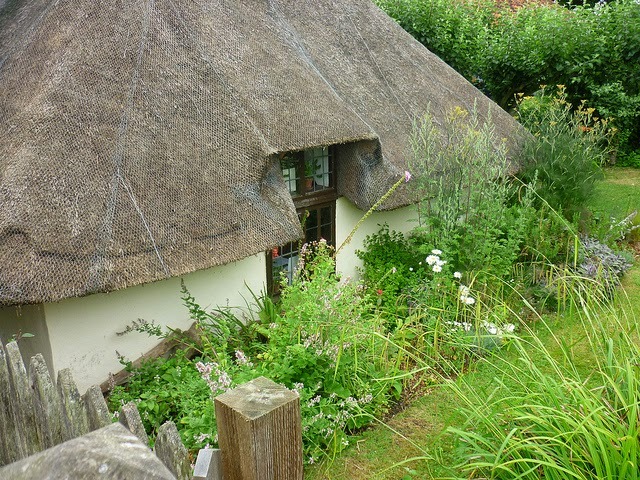 Of course a thatched roof works equally well. Does this qualify as a cottage garden? 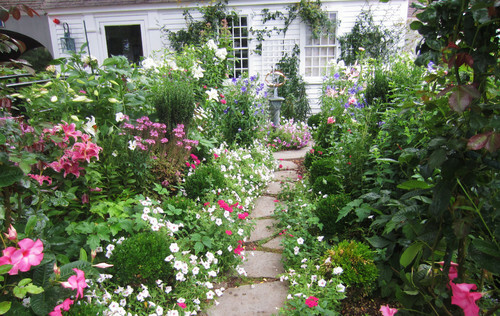 Typically a cottage garden spills over the walkway, and this one has a bit of a formal feel. 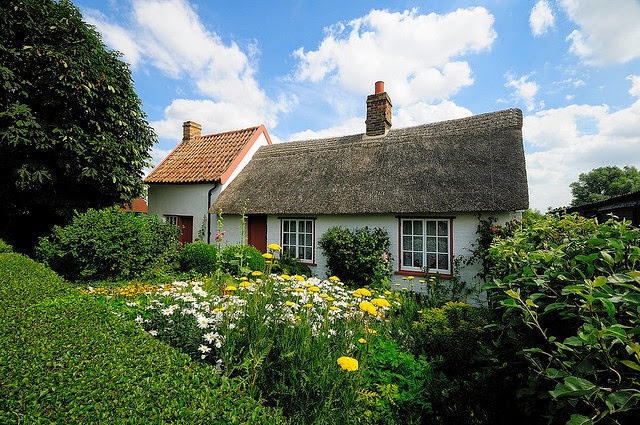 Still, there's no denying that's a cottage and it has a garden. Here's what I mean by spilling over the walk. 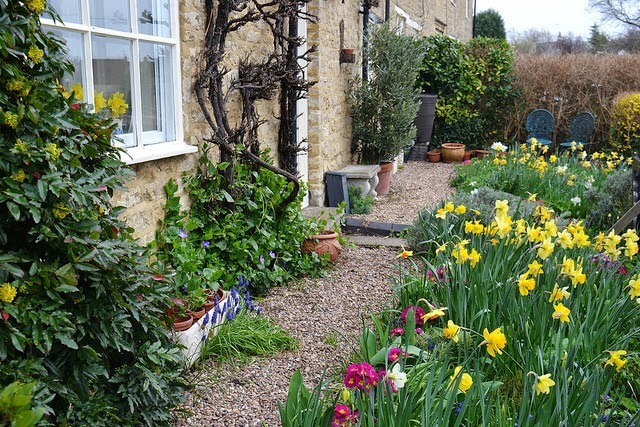 Love the hodge podge look of this cottage garden in the spring. You just know there are flowers coming for those containers. 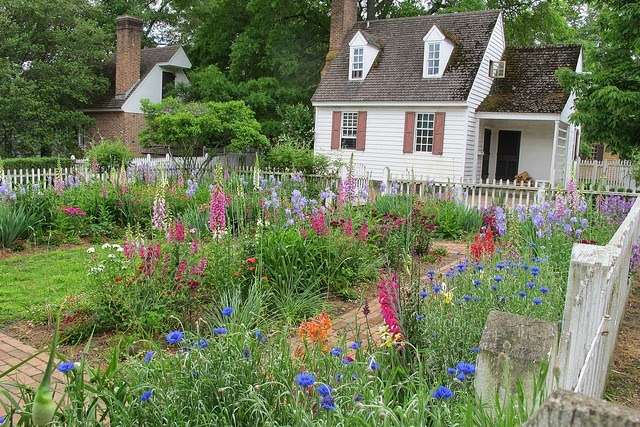 Every cottage garden needs Foxglove, Delphinium and Bachelor Buttons, as this one in Williamsburg, Virginia has. I've been to Williamsburg several times. The gardens there are wonderful. Clematis Humongous. I guess it's happy in Wale's climate. 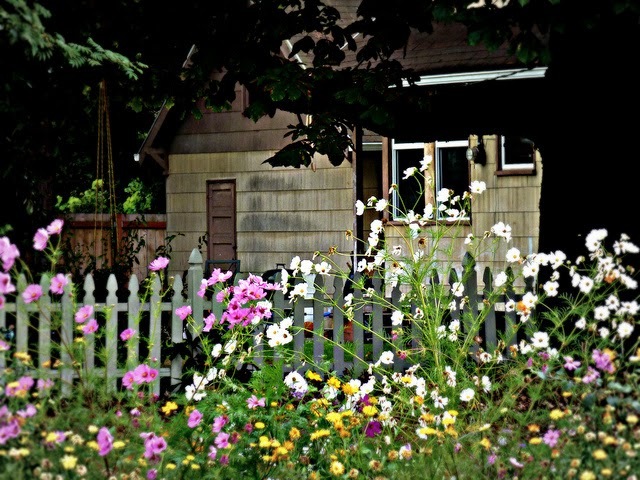 Pretty posies line a white picket fence outside this Washington state cottage. 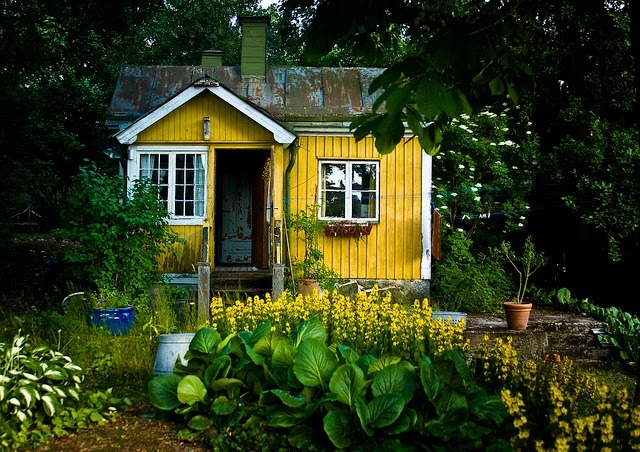 Yellow and green is the theme of the cottage and its accompanying garden. 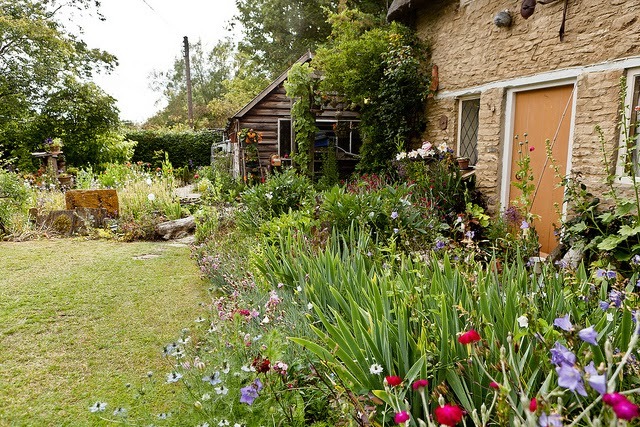 Here's a cottage and its garden in Derbyshire. 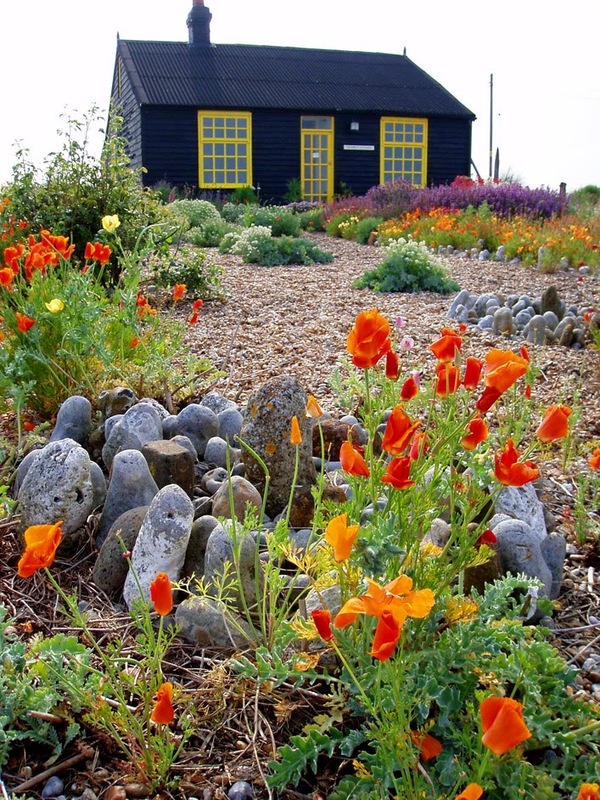 Would you classify this as a cottage garden? Though it looks a little too planned for a true cottage garden, the arbor and wagon wheel give it a whimsical look. Anyway, it's quite charming and deserves to be included on our tour, don't you think? No denying this is a cottage garden. There has to be a bunny in there somewhere. 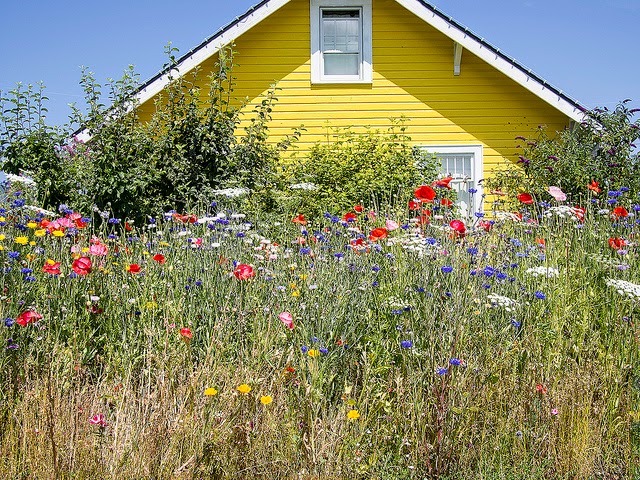 Wild flowers make up this Washington state cottage garden. 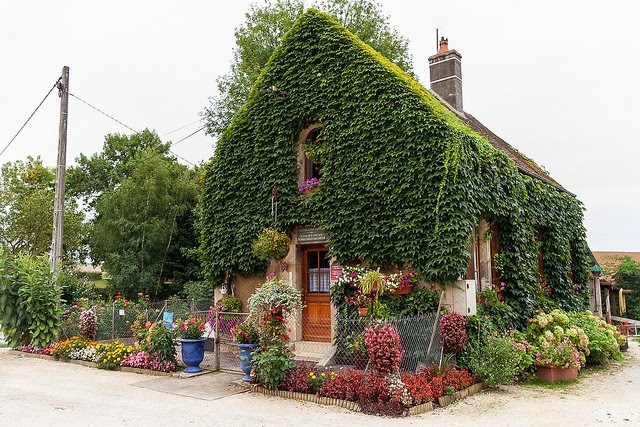 This French cottage is bathed in ivy and flowers. 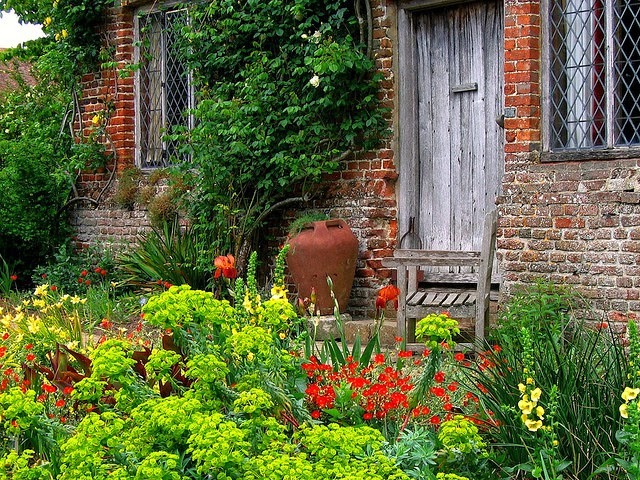 A cottage garden just outside the back door of this English cottage. It wouldn't be right not to show you its front. 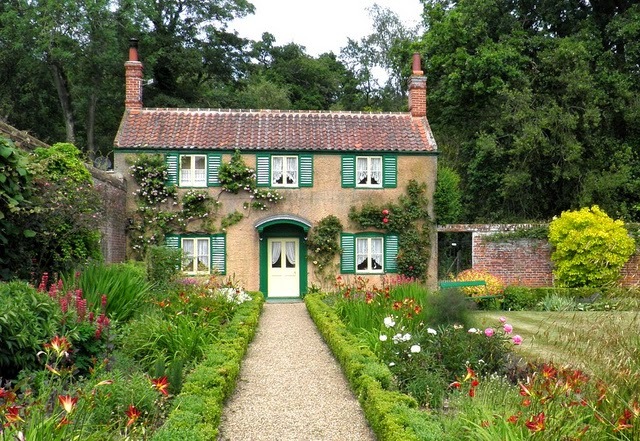 The lush "Rose Cottage" garden. 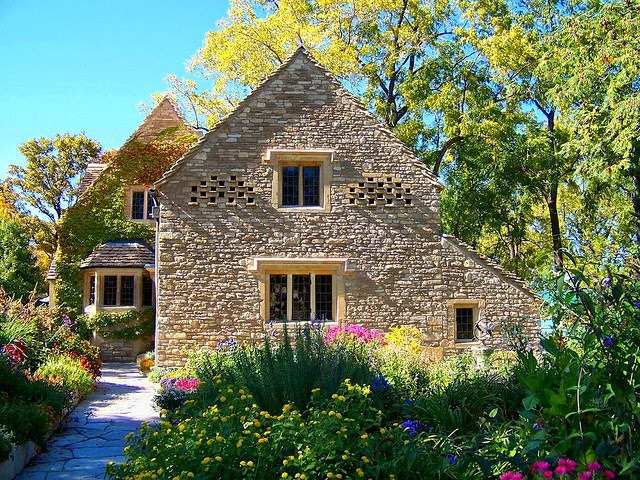 Interesting side note: Henry Ford purchased the Cotswold cottage in 1929, had it dismantled stone by stone and shipped to the U.S., where it now resides with its barns and fences in Greenfield Village, Dearborn, Michigan. 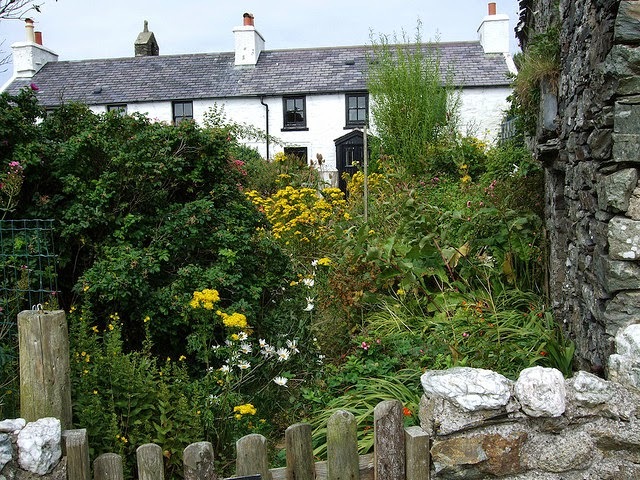 Here's another view of the garden and cottage. Imagine walking through these gorgeous blooms to the door of this Boston cottage. 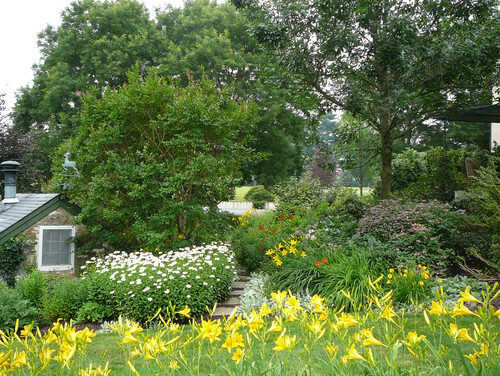 We end our cottage garden tour with this voluptuous garden in Philadelphia. 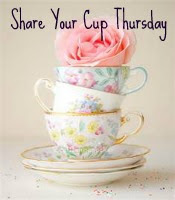 Thank you for joining me on this little cottage garden tour. Which one is your favorite? So beautiful - the houses, the gardens, the colours... love! I am in love . 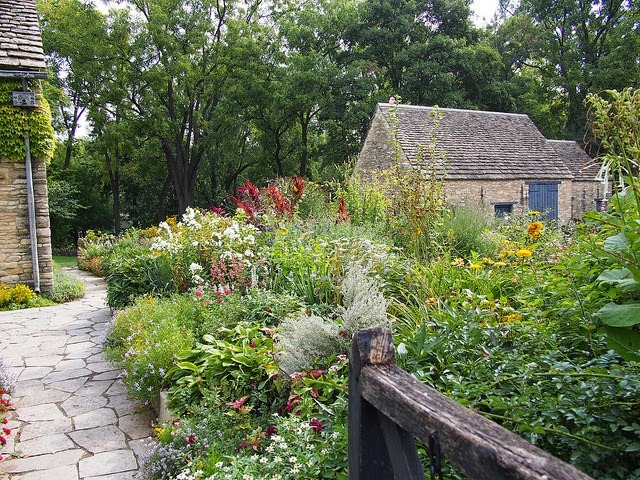 . . cottage gardens are my favorite and all of these had that touch. The weaving of color and texture tickles me right down to the tips of my toes. Loved this, now I am going back to look through my iPad where I can see the garden colors really pop! 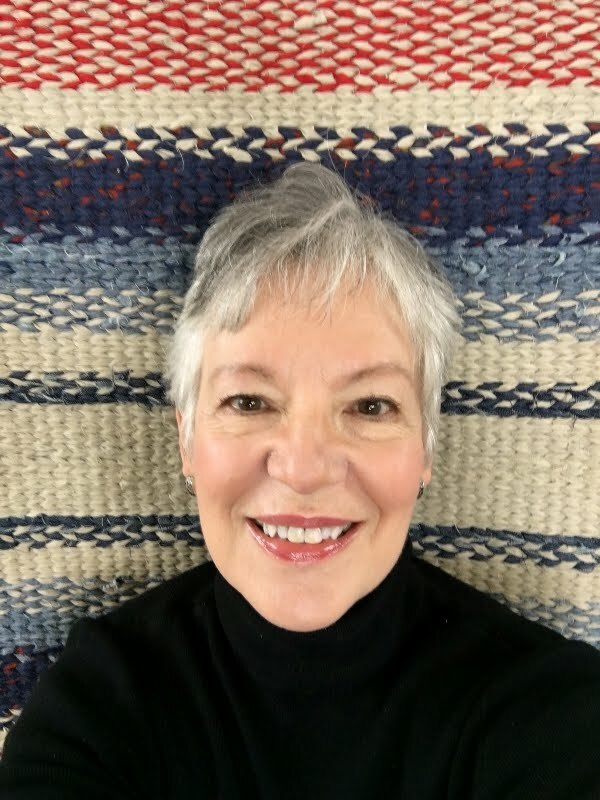 Thanks Nancy for a great post . . . I am just now browsing on my iPad. I was correct, the colors pop! I like the Williamsburg gardens and the Greenwich Village house nod gardens . . . oh dear . . . I loved them all. You're welcome, Lynne. My husband just got an iPad so I must borrow it to look at this post. Thanks, Lynne. Oh my Nancy, I was ohhing and ahhing over each and every picture. Cottage gardens are my favorite for sure! I visited Williamsburg once and I knew that garden. I loved it then and love it now. Had many of my favorite perennials. I don't love orange in the garden, but it works with purple. That's why I have my orange Oriental Poppies close to my purple Salvia. 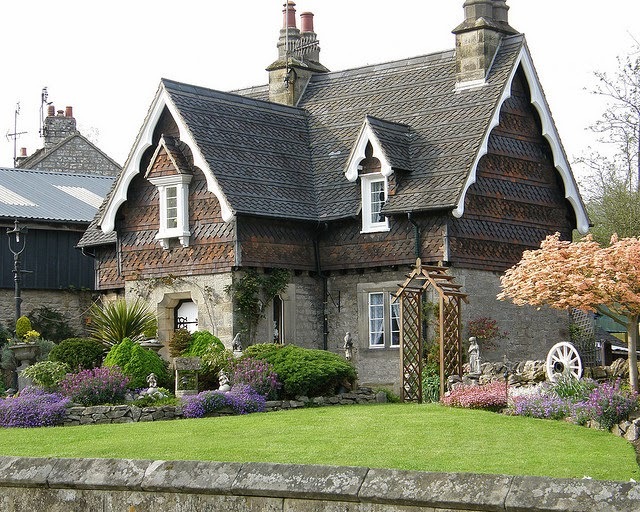 Thanks for sharing these delightful cottages and their gardens with SYC. 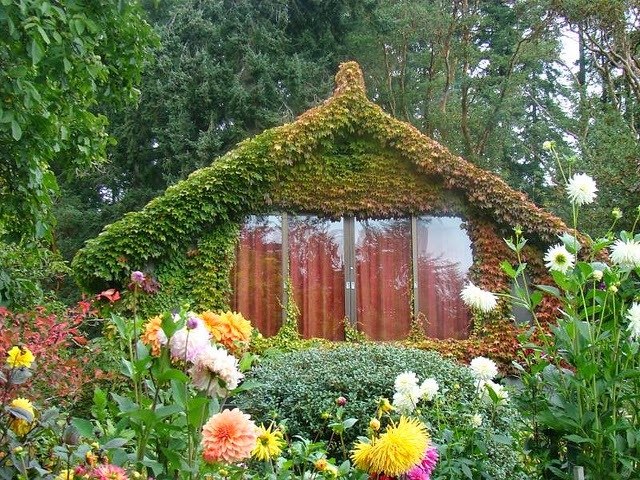 Nancy, those cottage gardens are amazing!! Don't we dream of places like that? I sure do. Thank you, Angie. I'm glad you enjoyed the gardens. Oh, I miss my garden also! We downsized into a new home which means starting with a clean slate for our garden. These gardens are beautiful!